Hello, welcome if you've arrived here by way of Michelle's blog on the Shady Tree Studio blog hop! If you didn't come that way and you'd like to follow the hop then back up to Shady Tree Studio where it all starts and find out how to be in with a chance of winning one of the eight sets of stamps up for grabs! 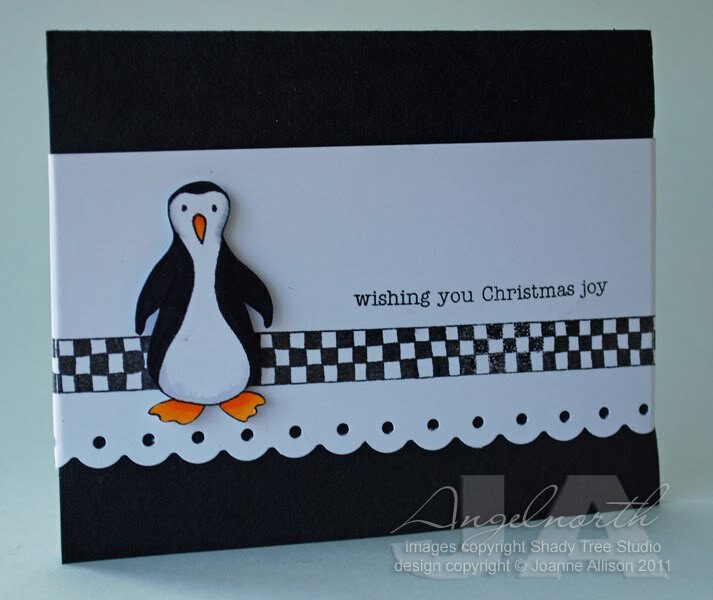 I love the penguin that features in the new Naturally Christmas set! If you've seen the movie March of the Penguins, you'll probably remember what an endearing sight it is to see a whole horde of penguins all stoically making their way across the snow and ice. I thought it would be fun to recreate that "en mass" experience on a pop up stage card! The penguins are quite tall so I added some torn card stock snowbanks towards the front of the stage to fill in the space (if your taller pop up items are too near the front they'll hang over the edge when the card is flattened down for mailing). 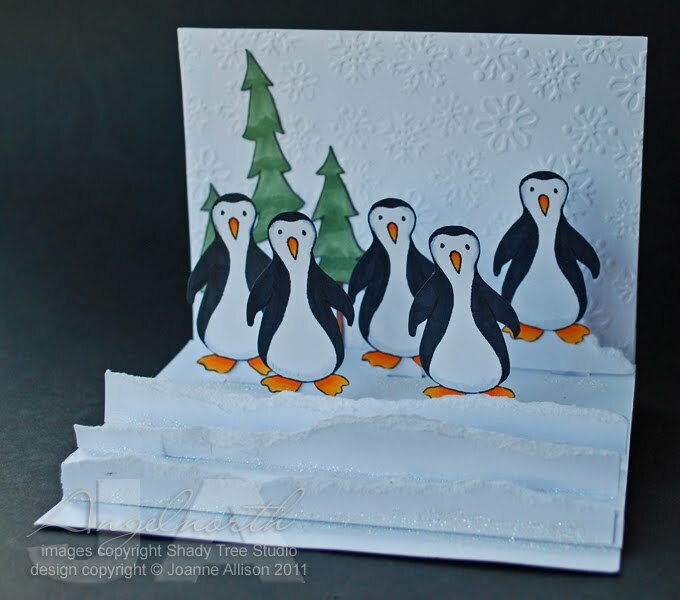 The penguin at the back is raised up on a torn cardstock hillock so he gives some variety to the height of the group, too. I wanted the trees to have taller trunks so I didn't ink up the end of the trunk before stamping so that I could extend the lines with a fineline marker. 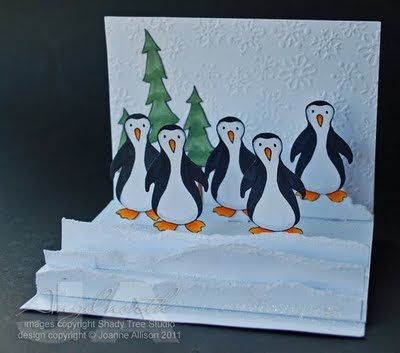 The back of the card is lined with a piece that has snowflakes embossed using a Fiskars texture plate and I sprinkled glitter around the feet of each penguin and along of the joins where the snowbanks meet the base of the stage. 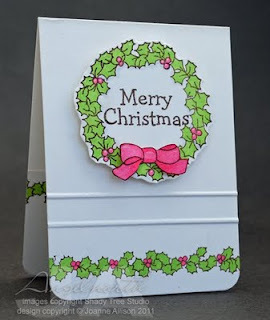 To keep the card closed, I created a belly band using the checkerboard border and a sentiment from the other new set being released today - Homespun Holiday. The checkboard lines up easily to extend it right across the band but if you're worried about it, just make sure the join comes where you want to place an embellishment or other element (the cut out penguin in this case). The lovely Carla is the final stop along the way, I'm sure she'll have something wonderful to share with you on her blog at Paper Pastorale. Hope you've been enjoying the new stamps so far along the hop! Sorry to have been missing in action - I've been busy with work and with crafting that I can't share with you yet! We're nearing the end of the month so my time as Shady Tree Studio's guest designer is almost over. 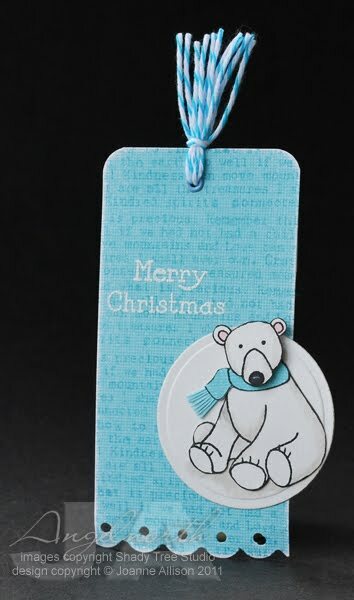 The new sets are released on 29th and the cute bear on this gift tag is in one of the sets. I've gone for a Polar bear look by adding just a tiny hint of shading with a warm gray Copic and otherwise leaving him white - quick and easy. He looks great as a brown bear too! I decided he needed a little extra protection from the winter chill so I've stolen the scarf - it really belongs to the snowman from this same stamp set! I paper pieced it onto one bear's body and then cut out a second head and mounted it over the top of the scarf on a foam pad. I cut a paper fringe to add to the end of the scarf, too. Thanks for stopping by! I'm playing along with the Shady Tree Studio blog hop tomorrow - it will start on the STS blog so do drop by if you have the chance - there will be a chance to win stamps! I needed to make an anniversary card so I took advantage of Splitcoast Stampers' Featured Stamper challenge yesterday to give me a kick start. The featured Stamer was Teri Anderson, a very creative stamper and sweet lady to boot! Teri has lots of great inspiration in her Splitcoast gallery and I chose this card as my starting point. 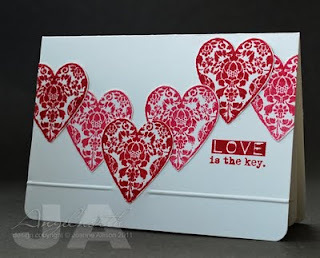 I stamped the heart portion of a Crafty Individuals collage stamp in two different reddish shades, cut them out and arranged them on the card base. The sentiment is stamped directly onto the card and a scored line just anchors the whole thing and stops it being too top heavy. Once again, the Scor It made my job easy in creating a line with a break for the point of the heart as the project is face up on the board so you can see where you're scoring. Thanks for stopping by, hope the week is a good one for you! I'm playing with Shady Tree Studio stamps again today for more Christmas in July. This little gift card holder gives the Holly Jolly set a contemporary look just by using a slight twist on traditional colours with a lighter, brighter green than your usual shade for holly and hot pink in place of red. There's an image of a potted holly in the set - I coloured and cut out just the bow from that to add to the base of the wreath. I finished off the inside by stamping the holly border along the top of the pocket that holds the gift card in place (you can just see it peeking out on the left side of the photo). A very simple design today but I think it's quite effective. I used white embossing powder for an emboss resist and then coloured the central bit with a touch of Copic marker (I think that bit is called a pistil but I'm no botanist so please don't take my word for it!). 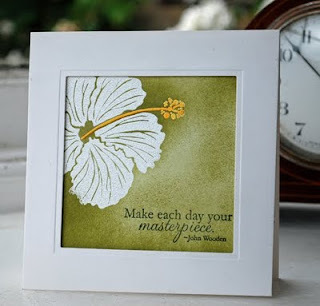 A simple Nestie cut frame is raised up slightly on foam tape and mounted over the card front. I thought the sort of gallery feel to the framing went with the sentiment. I'm joining some old friends this month as Guest Designer with Shady Tree Studio's Christmas in July event. Nancy, owner of STS, used to design stamps for CHF and some of her DT are old buddies from my days on the CHF team. Thanks for inviting me along this month, Nancy! In the run up to this year's release, we've been making some projects with stamps from the 2010 Christmas release. The Just Believe set has a lovely naive feel which is perfect for pairing with kraft! This clean and simple, one layer design would be suitable for mass mailing as it's totally flat so there's no risk of having to pay extra postage. Quick and easy to make too with no need for any specialist tools - you could whip up a batch sitting in front of the TV! 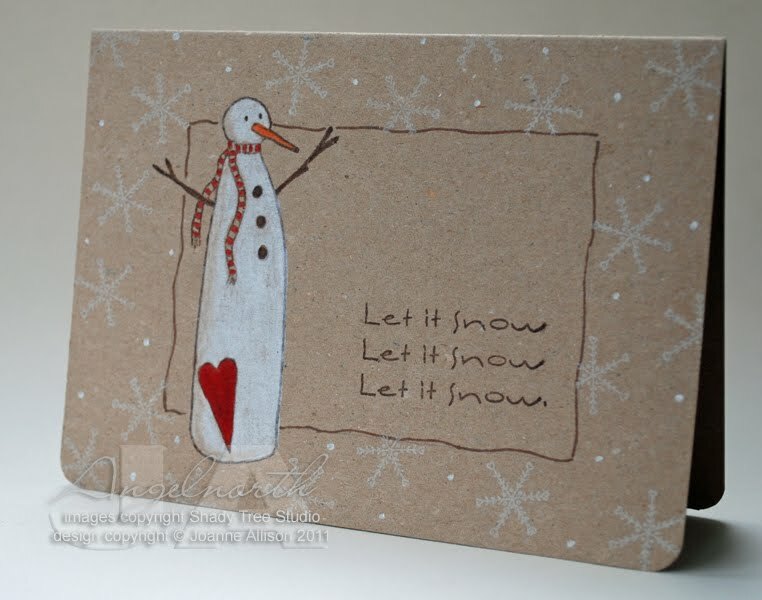 I simply stamped the snowman, added the border by hand with a fineline marker and stamped the sentiment. Slightly wobbly framing goes with the homespun charm of the image so no need to worry about trying to draw perfectly straight lines! Colored pencils (Prismacolor or equivlent) work beautifully on kraft cardstock as it tends to have a bit of "tooth" to it so you get good coverage of white for your snowman. I added a tiny bit of shading down the back of his body and head with a brown pencil. The snowflake is stamped repeatedly around the outside and a few white gel pen dots fill in the flurry. Thanks for stopping by! The DT girls have been posting projects all week on the Shady Tree Studio blog if you fancy a bit more Christmas in July! The theme for the postcard swap this month on UK Stampers is red, white and blue. It's impossible not to think of flags with that combination but I decided to try for something other than the star spangled banner or our own Union Flag and settled on the French flag instead. The blue and red sections are just ink swiped directly from the pad onto the card. 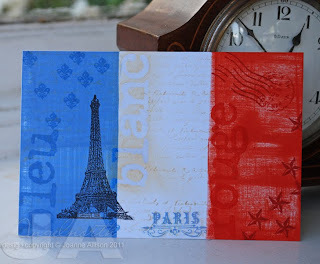 I used alpha stamps to add bleu, blanc, rouge to the three sections ("blanc" was done with Versamark and clear embossing powder) and then overstamped with a scripty stamp in Antique Linen. A bit of Antique Linen sponging helps to bring out the clear embossing a bit more, too. Sorry I forgot to announce the winner of the random draw for the papers earlier in the week. The winner is Janice! I'll get them sent off to you soon, Janice. It's colour challenge week at Less is More and the challenge is "shades of blue" - right up my street since I tend to gravitate to blues and greens. We met up with a friend on our recent holiday in Potugal and he gave us some wine and olive oil from his own vines and trees. We drank the wine while we were still away but we managed to get the olive oil back in one piece in a suitcase! We've just opened the bottle and so I wanted to send a thank you card. If you've been to Portugal, you'll know there are basically two national foods - salt cod and sardines! So I thought a little shoal of sardiney fish swimming in a sea of blue would make a good thank you. I scribbled three blue markers onto an acetate sheet, spritzed with water and pressed on to my card. 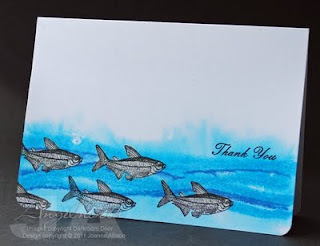 Then I did the same technique as I used on yesterday's card for the fish and finished with a stamped sentiment. 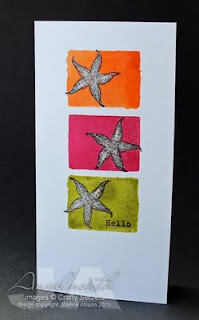 The challenge this week in the Crafty Secrets member forum over at Splitcoast Stampers is to focus on the colours of summer treats. I do like to take my Crafty Secrets stamps beyond the obvious vintage look sometimes so I've gone for a clean and simple, one layer card with a graphic feel to it. I've opted for orange, watermelon and lettuce for my colours: fresh fruits and salads - yum! The colour blocks are just "stamped" by inking up my smallest acrylic block, spritzing with water and then pressing it directly onto the card blank. The starfish were stamped with Versafine and then painted with bleach to remove some of the colour - Versafine doesn't react with bleach so your stamped image retains its detail.